Tiger Woods is one of the few Americans coming into the Ryder Cup in a rich vein of form, largely due to his performance on the greens. Despite talk of his mid-season putter-switches, his stats have remained strong: Woods ended the season 38th in SG: Putting, 11th in SG: Around the Green, 15th in Birdie Average and 16th in one-putt percentage. He also finished first on Tour in SG: Approach, which means a majority of these putts were for birdie. Pros generally don't make birdie putts at the same rate they make par putts, which makes the numbers all the more impressive. Over the course of his career, Woods has repeatedly leaned on one putting drill: One tee on either side of the putting head, which creates a "gate." Either you hit the tees, or you ingrain a straight-back, straight-through putting stroke that forces you to hit the ball in the center of the putter face. And surprise, surprise! Woods was spotted on the practice green using the drill on Thursday at the Ryder Cup. He started by hitting putts one-handed. He has his right hand on the grip with his left on his upper thigh. Before spending a few minutes pouring in putts with both hands. You'll notice that he's also incorporated an EyeLine Putting Mirror to make sure his eyes are over the ball and his shoulders are nice and square. Your Takeaway? 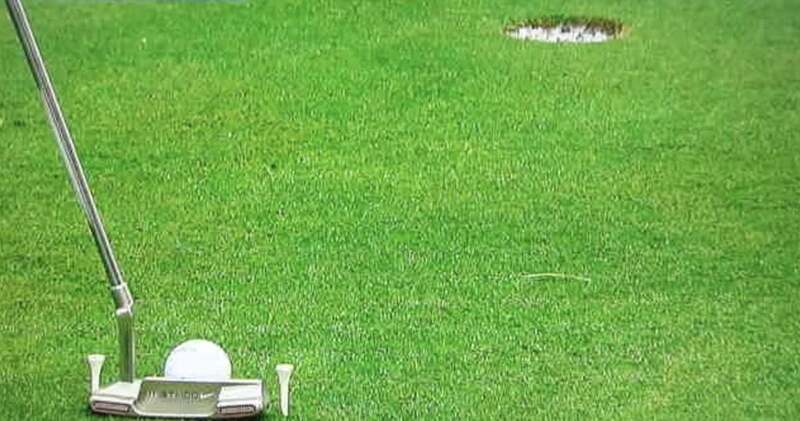 The beauty of Tiger's favorite putting drill is how wonderfully simple it is. Try it yourself the next time you have a few minutes on a practice green. All you need is two tees. Find a straight five foot putt or so, place the tees on either side of the ball, and practice making strokes through the "gate" you've just created. You'll find yourself hitting the sweet spot far more often.